Don't Let Poor Dehumidification Ruin Your Comfort | Quinnair Heating & Air Conditioning Inc.
Cooling your home is not the only job of the A/C system, it also removes moisture from the air. When the cooling unit is not performing as it should, it can make you swelter even more on those warm summer days and nights. It’s uncomfortable and not much fun. Here are the most common reasons of for poor dehumidification. If your air conditioner device is too old, it may be time to replace it. Over time, parts wear out and so your unit won’t do its job as it should. Don’t forget to schedule regular maintenance inspections, as a neglected unit can cause this problem too. If you have a single-stage A/C, it means that it only runs at one speed. This model reaches the desired temperature in your home quickly and then turns itself off. So, it doesn’t have enough time to draw the humidity out. Consider investing in a modern A/C system with a variable speed motor and air humidity control. If your unit is too big, it won’t run for a long time because it fulfills the cooling load quickly and then shuts off. Consequently, it won’t remove humidity from the air. 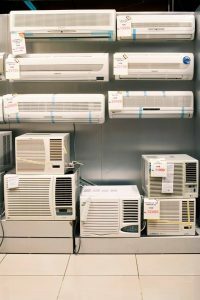 The correct size of air conditioners run longer. This means that if you want your unit to dehumidify your home while cooling it efficiently, make sure you select the right size. Expert HVAC installers will help you with this task. All in all, a bigger cooling device will not do its job efficiently. It will not only generate discomfort during the hottest days of the year but you will end up paying more on energy bills. On top of this, an increase in excess air moisture can also damage your house and reduce the indoor air quality. For these reasons, it is important to schedule regular maintenance with HVAC experts in Colorado. Call Quinnair at 303-980-3788 to see how we can help.